The back of this postcard reads ‘Feversham Ward, Salisbury Infirmary, April 1913. The ward was later given over to WWI medical cases. (Credit: ArtCare, Salisbury District Hospital). 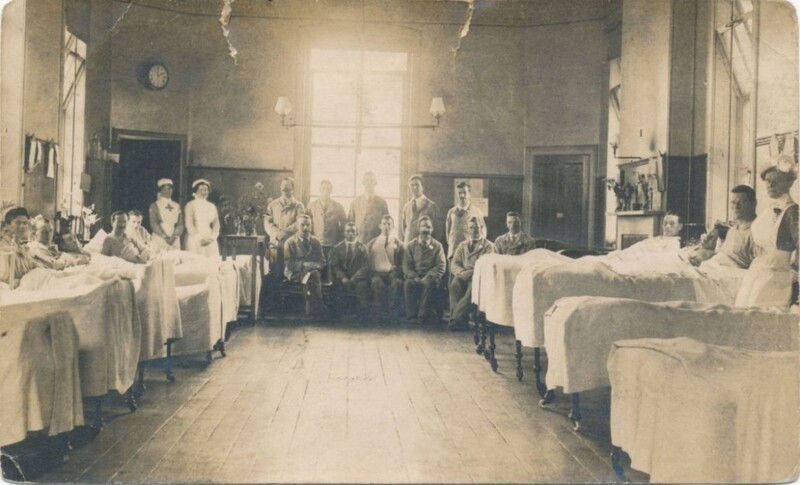 During World War I, Salisbury Infirmary underwent huge changes and was under great financial strain. This was due to an increase in the number of patients treated, along with a decrease in trained medical staff who were posted overseas to military hospitals. At this time hospitals were funded by charitable trusts and donations and by the end of 1914 the hospital debt had increased to £4,919 (equivalent of around £500,000 in today’s money) and the governors authorised the sale of stock to reduce the overdraft. After the declaration of war, in August 1914, Ald. Hammick chairman of Salisbury Infirmary made an offer to take in fifty sick or wounded soldiers. Feversham Ward, which had been empty for a few years, was equipped by the local Red Cross Society to receive 20 military cases. The Outpatients waiting room was fitted with a further 20 beds and named ‘The Roberts Ward’. The first convoy of 50 wounded men from France arrived in October. A few weeks later the committee agreed to also receive sick soldiers from camps near Salisbury. After this as many as 80 military cases were being treated alongside the civilian inpatients (averaging 109) making the total of 190 beds occupied. This imposed a strain on the medical staff, with no fewer than 940 major operations carried out during the year ending June 1915. 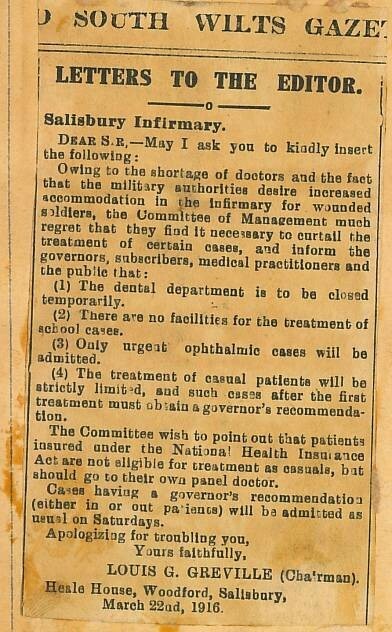 As well as the increased workload, soon after the outbreak of war, notice was received that nurses promised by the Infirmary to help the military were needed. Three sisters and one senior nurse were released to the army immediately. Others followed and a few months later 4 were with troops in France, 2 in Egypt and 4 in Territorial hospitals. In this emergency, assistance was given by the local branch of the Red Cross Society. 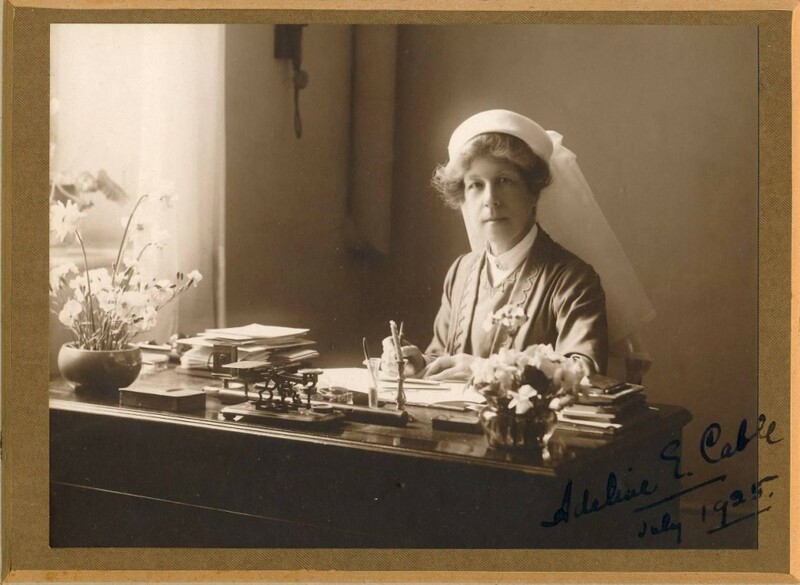 The women’s Voluntary Aid Detachment having 15 members serving on the wards and the men’s Voluntary Aid Detachment provided orderlies, stretcher bearers and ambulance service to and from the railway station. The whole of the clerical work dealing with military cases was carried out by voluntary staff of the Red Cross Society, which also supplied clothing to military patients. This press cutting from the South Wiltshire Gazette explains the strain the hospital was under and how services were cancelled to accommodate the military cases. This story was kindly donated by Lesley Meaker of ArtCare, Salisbury District Hospital.